A blog about eating ethically in an urban setting. It's getting toward the middle of September and I am getting ready for a trip to the East Coast during my sabbatical which will last one month. And I am getting nervous. Not about the trip so much as what will I miss the this next month at the farmer's market? I was hoping to get some butternut squash today, but I didn't see any organic ones. I hope I won't be too late for them when I get back in October. I must have a bunch of squash, butternut and others, for the winter. People always think it is strange that I buy a winter's worth of squash in the fall, but they will be just fine stored in my cold kitchen. I did get one small pumpkin this morning. And had to remind myself about buying more than I could eat this week--which was difficult to do. And I had to remember that my freezer is totally full. Not really any room to squeeze anything else in (well, actually, I did squeeze in two quart bags of chopped celery). See the photo of my freezer below. Actually, I know what I will miss the most, the people. My two favorite young farmers are contemplating some big changes for next year and it makes me sad to think they might not be "my" farmers next year. The vendors and people who shop regularly at the farmers' market become a little community. We care about what happens to one another. I overheard one farmer ask after the health of a woman's husband this morning, and a shopper inquire after the health of a farmer's husband. We talk, we get to know one another, it is personal not industrial. That's a big part of ethical eating for me--knowing where my food comes from and knowing that they have values like I have and that those values protect the earth, protect the community, and foster relationships. But just in case you might think that my trip east means I won't have ethical eating things to talk about, let me assure you I will have some culinary adventures--I will be in NYC for a few days, talking on community food security and environmental justice at Fairfield University in CT, and continuing to work on my sabbatical project (of the same subject as my Fairfield talk). I'll be helping my Dad, I am sure, take down the little veggie patch he has (yet I am hoping there will still be a few tomatoes when I get home). And am planning a book review blog entry on the book I am reading now for my research. I will offer one regret--I didn't get to can tomatoes this year. I have lots of jam, and jars, but the tomato season was a little late and my trip will interfere. Still, I was able to freeze a few pints of sauce and am continuing to dry lots and lots of them. Having a few pints of sauce will be good for pizza and such over winter, and having dried tomatoes will be good for soup, stew, pasta, risotto and lots of other things. Either way, the bright, sunny taste of summer is preserved. Next fall, I will be better prepared and perhaps a little less timid about the canning. I'll figure out some winter canning projects to keep my burgeoning canning skills. Take rest; a field that has rested gives a bountiful crop-- Ovid. It’s Labor Day weekend, which many of us associate with the last days of summer. A week or so ago I was asked to write something to be cross-posted on my blog and on my friend Deb’s business’s website—Roast House. I have been thinking ever since on what I would write about (she told me I could write on anything I thought was important and bore repeating—I told her that was maybe a dangerous thing to say to a philosopher!). But it is Labor Day weekend and as I walked around the Spokane Farmer’s Market this morning it struck me that for these farmers, Monday was probably not a day off, not a holiday. I am a professor and have spent most of my life in academic institutions in one way or another, so Labor Day really feels like the end of summer, since it is the beginning of the academic year. But we are still in the height of bounty of the agricultural season—the fruits and veggies of high summer are coming into their best and yet we start to see that which is good of fall—the winter squash and pumpkins, apples, potatoes and storing onions. There is likely a lot of work to do on farms on Monday. Labor Day in the US started over 100 years ago as a sort of day of thanks to those who work hard in the US, who by their labor were reaching out for the American Dream and achieving for the nation prosperity and strength. (For an interesting history check out http://www.dol.gov/opa/aboutdol/laborday.htm). As those things are challenged by tough economic times, it serves as a good reminder that there are many who have labored hard in this country for generations and some who have just newly arrived and farming is an entry into the American Dream for them. Agricultural labor has changed a lot in the US in the 100-plus years since the beginning of Labor Day, and agricultural labor has been almost wholly overlooked when we think about the holiday. It seems to have more to do with organized and industrial labor. But I won’t overlook this agricultural labor. Nor the labor in other countries that provide me with things I need and want. Worker’s rights are often a third or fourth thought for people who are concerned with local sustainable food, but for me it is high on the list. I want to know, as much as I can, that the food I eat was grown in a way that was good for the earth and good for who grew it. Buying fair trade or relationship coffee, as I do from Roast House, is one way of doing that. Buying from farmers I have gotten to know, is another. Asking questions and learning about what I eat, where it is from, and who is selling it are others. Knowledge really is power, as trite as it might be to say it. As I am asked, pretty frequently now, “what’s one thing you would recommend doing about food?” I find myself thinking about Alice Waters collection of essays from a special edition of The Nation (see http://www.thenation.com/issue/september-11-2006) a few years back called “One Thing To Do About Food” in which she had food writers, activists, and scholars write short pieces describing what they would do. I think in particular about Wendell Berry’s piece in that collection, not so much for the content he offered (although it was great), but for saying that he’d have to say two things. I am afraid I have even a third thing to say: know your values, know your food, put your values to work. A lot of our everyday values can have a food aspect. That the labor that helped bring food to my table isn’t taking a break on Monday, whether here in America or abroad. Agricultural labor is hard work, especially when done in a sustainable way with fewer industrial and mechanical inputs. In being part of the sustainable food movement in America and here in Spokane in particular I have gotten to know really great people who care for others and the earth, who think and work hard, who feel sad when there is an injury or death on a farm, who worry about the weather and what it will do to the crops and the livestock, who rejoice at the harvest and laugh with one another. That’s what I am remembering this Labor Day Weekend. The fall semester started yesterday, but I am on sabbatical. Even so, I have already had one meeting on campus. I guess that is what happens when one doesn't go far away for sabbatical. I am heading out of town for a chunk pretty soon, though. But, what I want to share today, is the article in the Fall issue of GU Magazine on my ethics of eating class. I was really excited to be asked to be interviewed for it and it was fun doing it, having the photographer into class (yes, that is actually a picture of the pizza we made before it went into the oven). It's good to be recognized for interesting work and good to share it with our whole university community. This marks the second time in six years I have featured in the GU Magazine--I guess I must be doing something right! It's a clever name, right? You might have heard of this restaurant, Founding Farmers, in Washington, DC--their pot roast was featured on The Food Network. I just got back from a quick visit to our nation's capitol. I have a friend, Nadine, heading to Nigeria, her first foreign service posting, and I wanted to see her and her husband before they go. It also gave me a chance to see my alma mater and all that has changed and stayed the same in The George Washington University's Foggy Bottom campus. Nadine knows I like good food, and by that, she knows I mean ethical food. She planned our meals lovingly around this fact. We went to the Falls Church, VA farmers market--bustling with people and stalls, some even making food in stalls. We gathers what we needed for the evening's dinner and brunch the next morning. And for Sunday she made and early dinner reservation for us at Founding Farmers. Now, when I say "early" I mean 4:30. We were trying to accommodate her sister's travel schedule back to New York. We went into the city, took in the Renwick Gallery across from the Old Executive Office Building. It's a small part of the Smithsonian with American art, including craft work. Some of the pieces are extraordinary and it is a shame most tourists miss them. It's August, in DC, and we were somewhat prepared for inclement weather. My flight coming in to National was "delayed" because of weather--we sat after landing for over an hour waiting for a gate at the closed airport to free up so we could get off. But Sunday afternoon, while we were at the Renwick, the sky opened up. Torrential downpour. We got soaked just crossing the street! And we got soaked again as we made our way the few blocks to the restaurant. But by that time it was only 3:30! I swear, some people were having a late brunch. They were nice and happy to seat us immediately, even though we were an hour early for our reservation. Laughing about how wet we all were, we were greeted with a pretty extensive menu and it took us a while to figure out what we were going to have. But what a treat, eating at a restaurant that had really good food values. That made it all the harder to decide--nothing was really off limits for me. We settled on fried green tomatoes to start, served with goat cheese and a green goddess dressing. 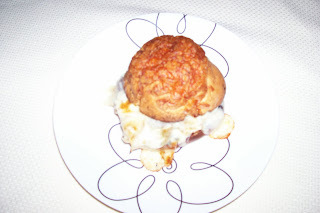 At first I thought the breading was a bit much, but with the tangy goat cheese it was a nice pairing. I had a "Farmers Fizz" cocktail--simple and light--gin, St. Germain and prosecco (that's a sugar cube on the bottom which makes for more bubbles rising to the top) and for dinner I had meatloaf served with a white mushroom gravy, mashed red potatoes and asparagus with lemon zest and tarragon. Delish! We did decide, as we all snagged one of Brian's french fried (which were good) to test the homemade ketchup that what I think was raspberry vinegar in the ketchup made it a bit too fruity--we don't want anything messing with ketchup unless we are warned in advance and expect it. My only regret was that it all was so good I didn't save room for desert. I have been thinking about how to blog about this for almost a week, so I am just going to go with the flow. About a month ago, a member of one of the advisory boards of the University asked me if I would pick a book and come lead a discussion with her and her book group. I said yes. It would be a hard thing to say no to. I picked the book I usually assign to my class, Peter Singer and Jim Mason's The Ethics of What We Eat. It's accessible to a non-philosophical audience, has a lot of interesting facts in it and covers a lot of ground. While I am not a utilitarian and take care to highlight this and the parts that are very utilitarian to my class, it is a good, fast overview of a lot of the ethical issues that make up the landscape of the discussion. Some are given shorter treatment than others, some perhaps more treatment than they deserve, in a classroom, I can mitigate those effects. As the day of the book group approached, I got a little more anxious. I likely was going to be speaking with a group of fairly well-to-do women. I did not know their educational background or anything really about them. In a class, I have time to get to know students and figure out what to focus on. In a one shot deal, not so much. And while I have done some unconventional speaking in relation to my academic work in the ethics of food, this might be the most unconventional. The discussion mostly focused on ethics and food as it related to personal health, which is often the first thing people want to talk about. I tried to connect it to the health of the environment, animals and workers rights, but it was a bit of a tough sell with some of them. I gently corrected some common myths about diet and health, about the environment, and about how government regulations do and don't work. On reflection, though, it's not a bad idea--have an expert (yes, I guess I am the expert here) in to talk to a book group. It's the M.O. of this group. And if I ever get asked to do something like this again, I will be better prepared and have a better idea of what to do and how to work in that setting. I guess everyone learned something, then! Watching the pictures on the news of what is going on in Somalia I am often brought to tears. And watching this news, these starving children and refugees huddled together to tired and weak to cry reminded me that I have almost always been a food activist. As an elementary school child I collected cans and bottles for the nickel deposit to raise money to send to Ethiopia. I even got some of my friends involved and got my Dad to let me use a lot of the space in the garage to store the empties. I was so moved by their plight that I had to do something. I really felt called. And there have been famines since then, they move me as well. I teach about famine when my ethics classes cover poverty. I remind them that it doesn't matter which famine the author is talking about, it doesn't make the article out of date, there will be other famines and the arguments still hold. I hope they prompt some to act. I often have to turn away when the news is on and there is famine. Amartya Sen, Nobel Prize winning economist and development scholar was right when he said that pictures on the news of children actually starving to death is horrible and has kept there from being a real famine in some places. He wrote this when talking about his native country, India, and how they have not had a real famine in the modern age, but that malnutrition still plagues the nation. It plagues many others as well. But the actually starving is more likely to move us to action. And while malnutrition is a real problem to be solved be it due to a lack of food overall or a lack of access to nutritious food, starvation must be dealt with first. Consider donating to a charitable organization working in East Africa right now. Choose which one you think is reputable and will do the most good with your money, but try not to sit idly by. What's the best part of a Philly Cheese Steak? For some it is probably the steak, for others that drippy cheese, but for me, it is the grilled veggies. Love those grilled green peppers, onions and I add mushrooms. I have been eating rice salad leftovers from a dinner party since the dinner party. And I just couldn't eat it again for lunch today. So I grilled up some veggies on my new electric indoor grill, split a roll, and broiled some cheese over those veggies. Yum. 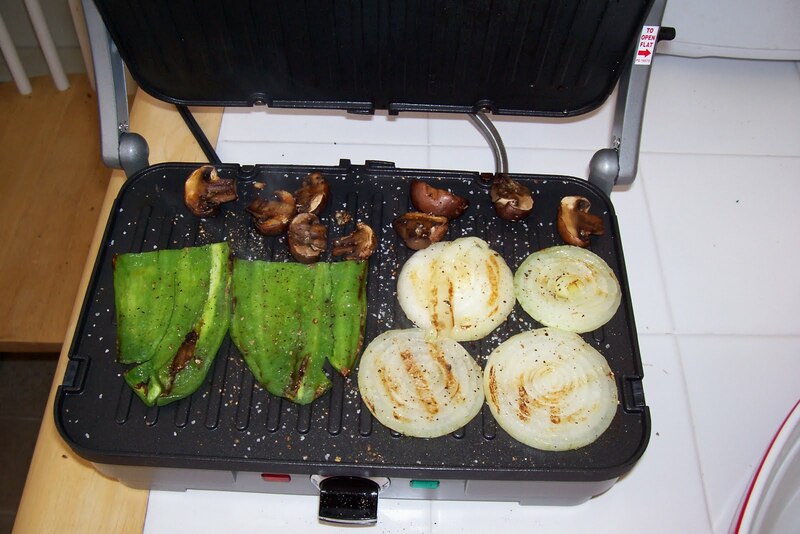 The onion and green pepper were organic from the farmers market -- who cares if the green peppers were a little small? Perfect for the grill! And the mushrooms were organic (from the co-op) and the single leftover skewer from that dinner party (it didn't fit on the grill for the party, so I just threw it back in the fridge). It's getting to be the hot summer we usually get in Spokane, the farmers are getting in what they can at this late part of the season, and I am not wanting to spend all day in my hot kitchen, so the indoor grill and taking advantage of whatever I get at the farmers market is great. Having a few go-to recipes that aren't salads of any kind but are seasonally friendly (both in ingredients and in low use of the oven) are key. It's a little late for berry season (silly weather! ), but it is, oh, so good. On some mornings in the northwest it makes more sense to eat a little cereal with my berries than a few berries with my cereal. Yum. I have had strawberries, blueberries, blackberries and raspberries. I have eaten them fresh, made jam and preserves, and am now baking of them. Yesterday I looked around for a recipe for a strawberry cake. 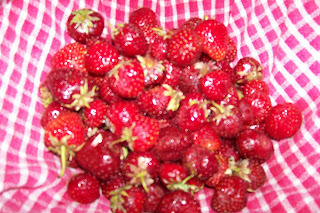 This is in part due to the bad recipe for strawberry muffins I tried last year which resulted in damp, soggy and too salty muffins. 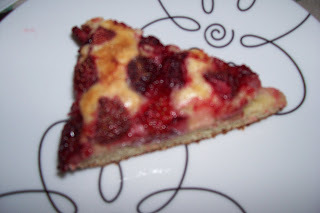 And I found a recipe that with a little tinkering is just about perfect and really nicely versatile, because it doesn't depend on the moisture of the berries to keep the cake moist. The berries are sort of a garnish, which means much can be done with it. A friend today remarked that it looked like an upside down cake--and I guess it does, but it isn't "flipped." 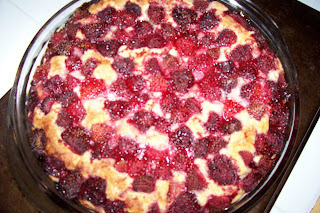 So, I baked it up with the last pound of the berries I picked at Knapp's and am planning on whipping up some variations soon. It's easy and simple, too. I have decided that this is the kind of cake I like--forget the fussy and complicated. I want a cake (and food generally) to show off its perfect ingredients, instead of covering up blander or tired ingredients. Covering up ingredients or getting too fussy is all too common now. No wonder so many of us have forgotten what a really sweet strawberry or a garden-ripe tomato (forget that "vine-ripened" stuff that still tastes pretty bland but has the stem still on it) tastes like. Cooking should show off the ingredients and only in doing so show off the skill of the cook. If the ingredients are good, even an average cook becomes genius--and can take credit for a little bit of what nature has already done. Preheat oven to 350 degrees. Butter a 10-inch pie plate. Sift flour, baking powder, and salt together into a medium bowl. Put butter and 1 cup sugar in medium bowl, mix on medium high speed of electric mixer until pale and fluffy, about 3 minutes. reduce speed to medium-low; mix in egg, milk and vanilla. Reduce speed to low; gradually mix in flour mixture. Transfer batter to buttered pie plate. 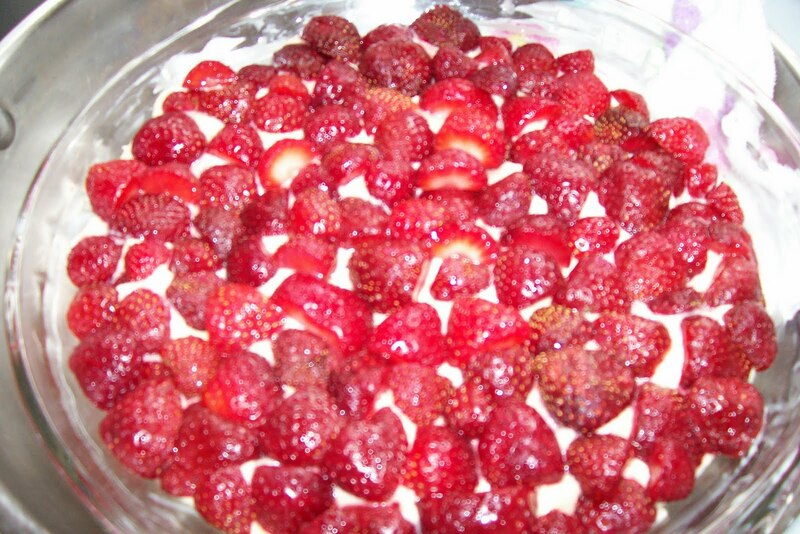 Arrange strawberries on top of batter cut side down and as close together as possible. 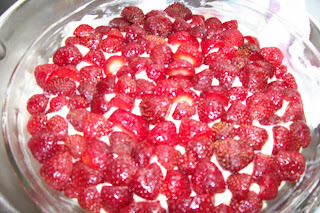 Sprinke remaining 2 tablespoons of sugar over berries. Bake cake 10 minutes. 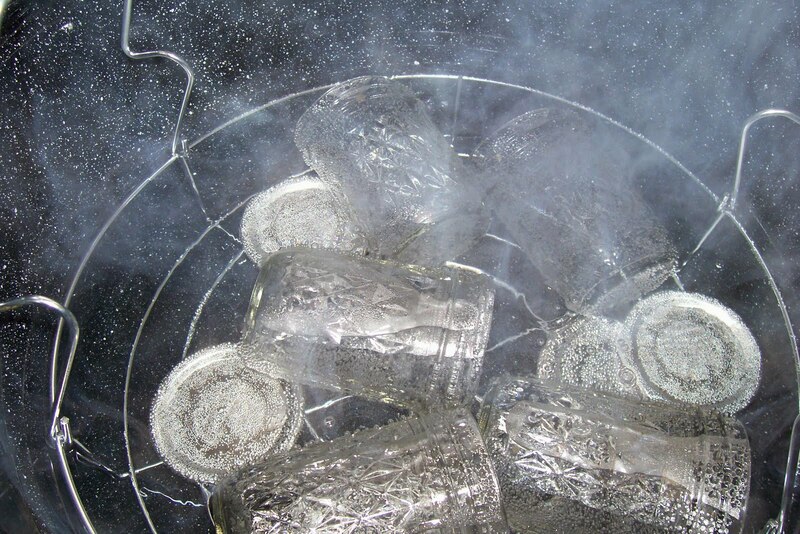 Reduce temperature to 325 degrees. Bake until cake is golden brown and firm to the touch, about 1 hour. Let cool in pie plate on a wire rack. Cut into wedges. Great with ice cream or whipped cream. Use almond extract with strawberries and add 1/2 cup slivered almonds to batter. Use raspberries instead of strawberries. Use blueberries and add zest of one lemon to batter. Use diced apple and add 1/2 teaspoon of cinnamon to the batter. "Fresh." Back when I was a child being fresh was not a good thing. When we had been rude, mean or sassy, my Mom called it "being fresh." I know I am not alone in having this term have a derogatory meaning in my personal history. But there are some things that we expect to be fresh and that is a good thing--produce is high on the list. Last week I returned home after visiting my family on the East Coast for two weeks. I came home to a refrigerator containing mostly condiments and a couple of single serving sized containers of yogurt. I was so tired from my early flight that I had something from the freezer for dinner and went to bed at 8:00. But, Tuesday rolled around and I had to go to the grocery store. And, what's worse, I knew I would be going to the farmers market the very next day. But I did have to buy some produce, so I decided to "treat" myself and got a small package of organic grape tomatoes. It's been a cold spring and though the summer is warming up, I don't expect to see a tomato at the farmers market for a while. Even when I was back east, my father's tomato plants just had a few green ones on them--I should have known better. These tomatoes are wildly disappointing. They are underripe, and yet some of them are going soft. I am eating them only because I hate waste more. I think by tomorrow I will have finished off the little box of them. But for me, it is just a good reminder that what is fresh is best when it comes to produce and I have gotten accustomed to very, VERY, fresh--picked just a day or so before. So while "don't be so fresh" was an admonition of my youth, it's not something I'll ever say to a farmer! This was not the treat I thought I was giving myself, but a lesson about seasonality. I'll wait patiently for tomatoes from now on. I just got back from two weeks on the east coast visiting family. It's the break between the end of summer school and the beginning of my first sabbatical. And I am taking this week off, too (with the exception of a department meeting today). It's amazing what changes two weeks in the peak of farmers market season brings. When I hit it on Wednesday there were so many different things that hadn't been available when I left--apricots and green beans to name a few. And we now, even though it is late, have berries in full force. In fact the day after I got back from the east coast I went strawberry picking at Knapp's up at Green Bluff. I picked 11 pounds in 45 minutes. It's a bargain at 99 cents a pound (if you buy a pre-picked ten pound flat it is still a good price at $25). My intention with these strawberries was to learn to can. I have wanted to for a while and with the encouragement of friends and the gifts from other friends (one college friend gave me canning equipment for Christmas and another a beautiful canning cookbook--I am indeed lucky). So, with OCD-like compulsion I read the instructions on making strawberry jam. My goal was to make jam and have all the jars seal--I really don't want to kill anyone. I approached this with the same trepidation as I had learning to drive (I remember saying to my driver's ed instructor, "but this is a lethal weapon" referring to the sedan I was getting into). 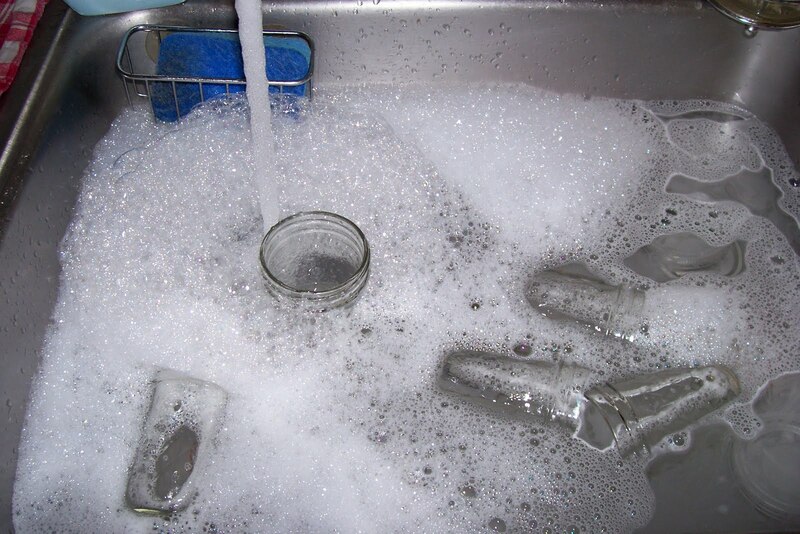 I read the instructions in all three canning cookbooks I had, those than came with the water bath canner, those that came with the canning equipment, the jars and the pectin. I even read the basic instructions on the USDA webpage. I really, really don't want to kill anyone. So I was really happy when those first four jars sealed properly with the satisfying "pop, pop, pop." It actually took a lot less time than I imagined and was easier than I expected. 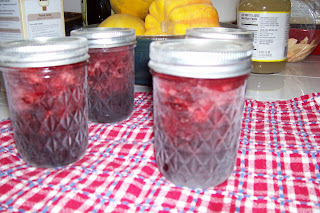 I was so enthralled with those first four jars I started on another recipe using more of those strawberries. I am now the proud owner of 4 jars of strawberry jam and 6 of strawberry lemon preserves. I can't wait to do more and to move from jams to pickles and then on to the reason I wanted to learn to can in the first place--tomatoes! Making strawberry jam really is pretty easy once you overcome the fear of giving someone botulism from the canning process. 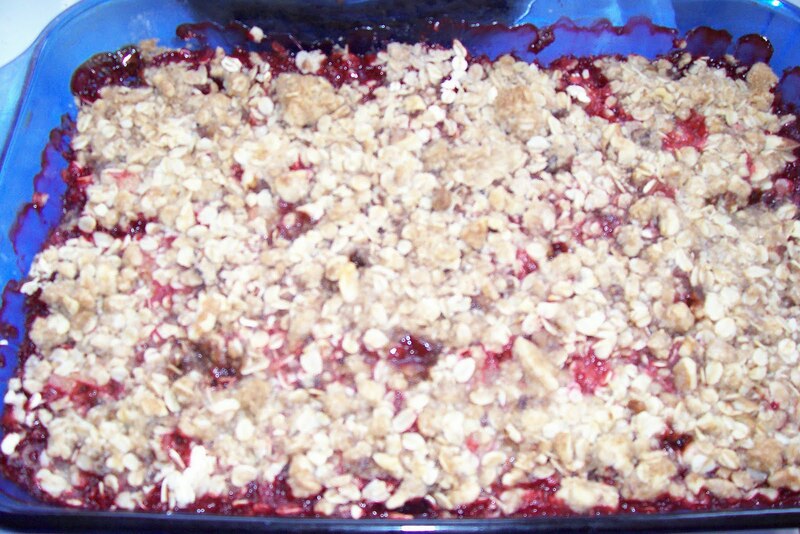 It has just three ingredients--strawberries, sugar and pectin. 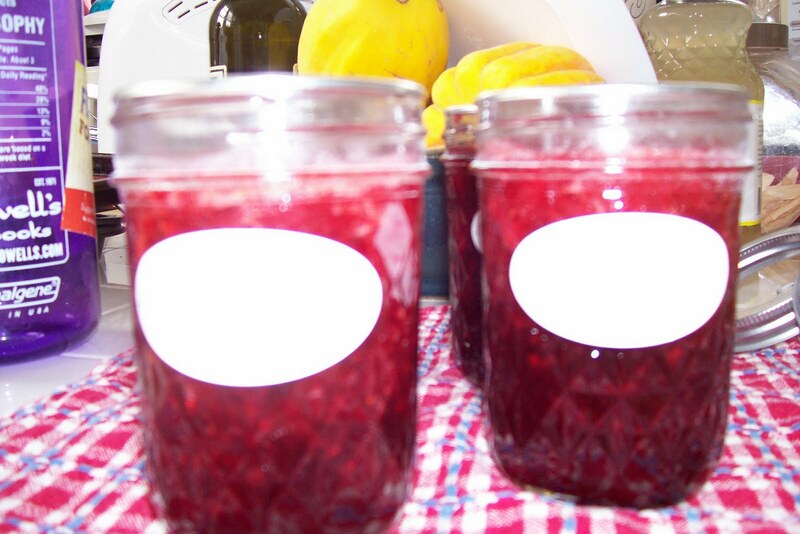 It takes more work to prepare the jars and boil the water for the canner than it does to prepare the berries and boil off some of the liquid. 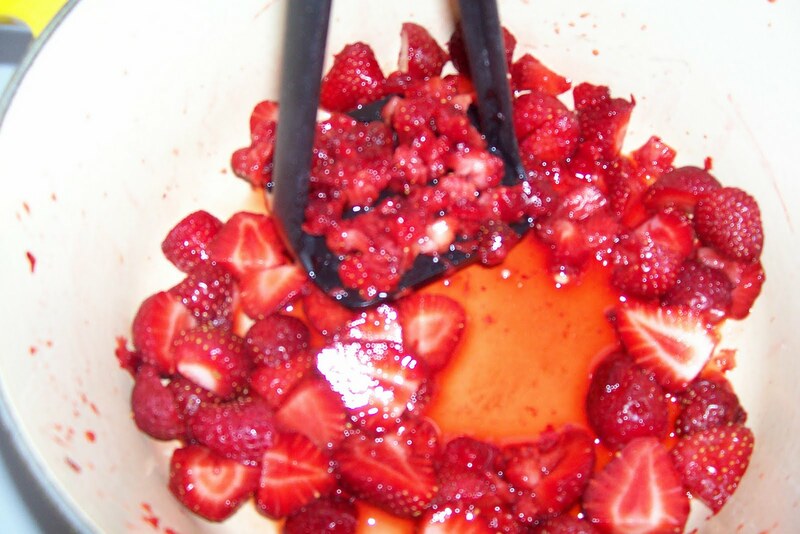 Strawberries are high enough in acid content not to need added acid in the jam mixture to make it work safely, too. But washing the jars and mashing the berries was all in the service of this beautiful jam. strawberries and lemon--a favorite combo! 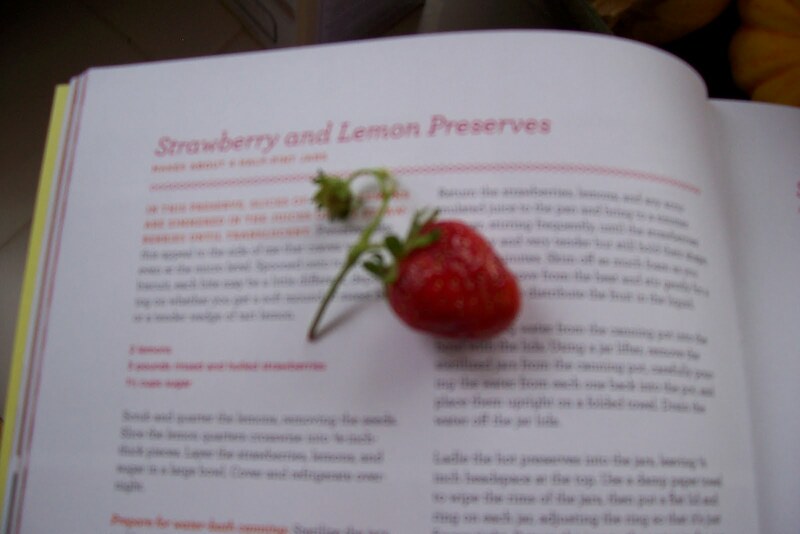 My second recipe was just a variation on the first--now strawberry lemon preserves instead of strawberry jam. The recipe called for macerating the strawberries and lemon slices in sugar overnight. It is luscious and delicious. This is one that I already have a friend who has requested a jar! It is good, sweet and tangy, a little bit different and I think will make a good gift! I am so pleased that my first few canning attempts appear to have worked well. And with new confidence I am already planning more things to try--I am a canning fiend. I don't always catch Jamie Oliver's Food Revolution on television, but I did last night. It was heartbreaking. But also very telling. The LAUSD doesn't want him in their kitchens with his cameras because they are fearful of being criticized on television and I don't blame them. I am sure he'd be criticizing them. But, as Oliver is pretty clear in his presentation, this isn't just about healthy food, this is about healthy people and healthy communities. This is why healthy food really is an ethical issue. It might be easy to think that healthy food is an ethical issue because of the environmental impact (hey, even my ethics of eating course is cross-listed with environmental studies). But there is a real human impact as well. Oliver himself started to break down when he spoke of 17 year old West Adams High School students, including boys, breaking down in tears, talking about their fears. Their fears ad to do with family having health related illnesses like Type II diabetes and hypertension. These kinds of health related illnesses are in epidemic proportion in the US right now and it has taken a Brit for some folks to see the light. Oliver has forged a relationship with these kids and this school. He has said he won't abandon them, moving his kitchen where he will teach classes to their neighborhood. He's shown the administrators what is possible at a school not unlike theirs--healthy food, a teaching garden, and kids eating and enjoying the food prepared from scratch by happy food service workers finally getting to use their skills. When people say they don't have time to cook, I understand, but I think to myself, I don't have time not to. I am pretty sure that healthy meals prepared at home will pay me back with a healthier, longer life. I try to pass this idea on to my college students in my class and I hope that they can take it to heart. It also isn't more expensive if it also means one eats out less, buys junk food less, and doesn't just replace high fat, salt and caloric foods with other kinds of processed food. I hope Jamie Oliver perseveres. He is doing good for people. It is good for us to see how much he cares about this, how it frustrates him not because he isn't making good tv (after all, even getting shut out of the LAUSD does make good tv), but because he cares about these people and what their diet means to them, to their families, to their community and to their future. This is an ethical issue because it either contributes to or detracts from a flourishing life. If you haven't see The Food Revolution, check it out. Lots of the episodes can be found on the website, too. I don't normally plug tv on this blog, but I do think this one is worthwhile. And, if you are parents who need to inspire young kids try this PBS web-only show, Fizzy's Lunchlab, developed by a former student of my Dad's. It's cute, has some good ideas, and even encourages kids to want to cook. 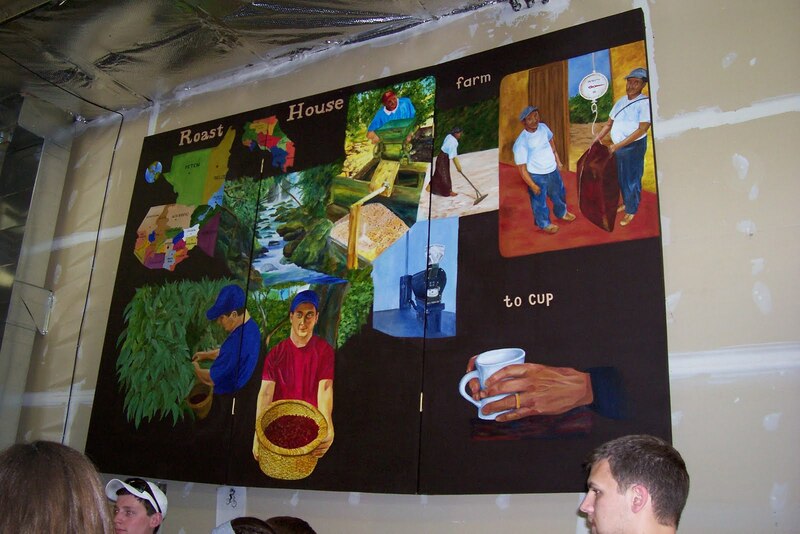 Fabulous Mural at Roast House. It's been a busy week in ethical eating. On Tuesday I took my class to Roast House for a tour and discussion about coffee. They were impressed and we all had a really good time learning about the roasting process and how Deb and Dave choose which coffee to buy and how it meets their ethical and gustatory standards. I always learn a lot and have a great time visiting them at their place. 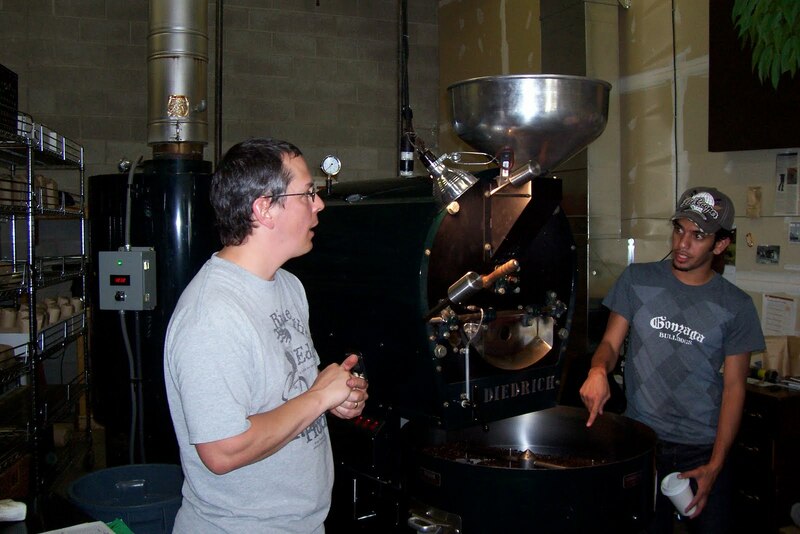 Deb and Dave are great educators about coffee and how we can choose better quality coffee that is also more ethical. I don't know if they think of themselves as teachers, but they are. I really ought to ask them if they do think of themselves that way. 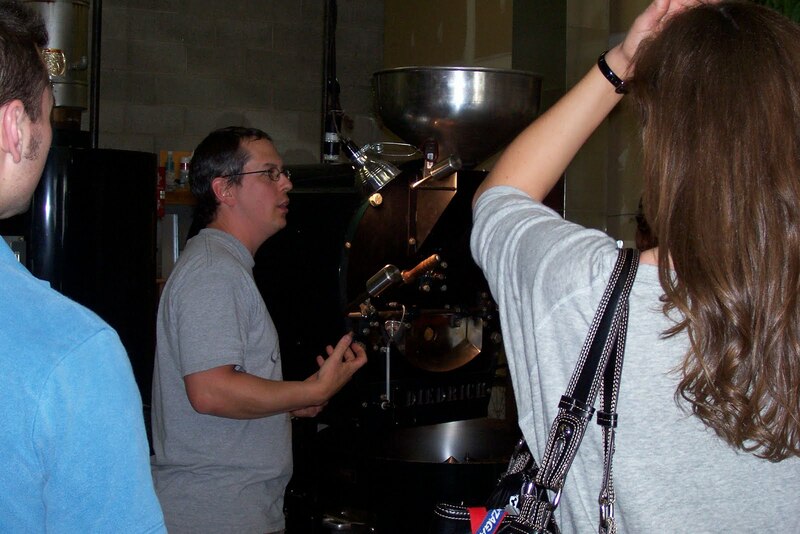 Dave in his element--teaching about roasting! One of the interesting things I learned has to do with coffee itself. Perhaps I should have been able to figure this out myself, but I hadn't. I knew that roasting coffee differently made a differently tasting coffee. But it really had never occured to me that roasting the same beans in different ways made for completely different but perhaps an equally palatable finished product! And, I had no idea that a just warmed green coffee bean would smell like a mixture of grass and fresh cut alfalfa. But it does! Mubarak, one of my students, asking a question. Deb told us that part of the reason that specialty coffee prices are going up has to do with Americans buying good coffee. The demand for the best beans has extended to the countries that grow them making those beans in far greater demand. Coupled with some bad weather in coffee growing regions, expect prices to go up. Given that--find some place that sells a good product and buy direct from them if you can. And when I say good -- I mean at minimum fair trade (farm to cup or relationship is still to be prefered I think), organic and shade grown. If you are in the Spoakne area--check out Roast House. They even sell in Yokes now! Tuesday night I headed pretty much straight from class to a meeting sponsored by the Spokane Regional Health District. 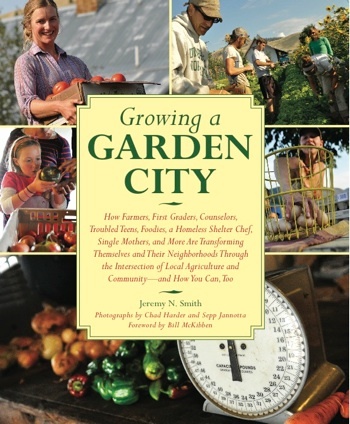 It featured Jeremy Smith, author of Growing a Garden City, a wellness consultant, an economist interested in sustainable food and a presentation by the Heath District on the information gathered in their food assessment of Spokane county. Smith was entertaining and inspiring. 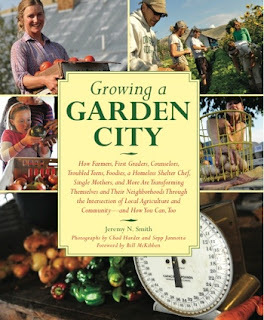 I even bought a copy of the book which he inscribed "To Ellen, Keep Growing! Jeremy." A simple sentiment that in the quest to educate about sustainable, ethical food, means a awful lot of things. But the information that was the most important and disturbing came from the Heath District. I knew things were likely to be bleak--too many kids living in poverty without good access to fresh food, too much fast food available, etc. But food deserts in Spokane county? Really? We grow so much food here. A food desert up in Green Bluff where there are all those farms, orchards and u-pick places? It breaks my heart. The USDA has defined "food desert" (like so many other important terms about food) in a really complicated way. But the idea is that there are some areas where there are no grocery stores. People therefore do not have reliable, easy access to fresh, healthy food. They USDA now even has a "food desert locator" where you can put in your zip code and see if that region qualifies. Went to the first Wednesday market of the season to get some produce for cooking in class on Thursday. Chatted with my favorite farmers, bought some rhubarb for the crisp, some fresh parsley, onion, and zucchini. For myself I bought some leeks, radishes and peas. I am going to cooking this weekend even though it is already busy, I just know it! I ran to the co-op to get a few things for my class's cooking adventure--I needed canned tomatoes and olives, vegan "cheese" and some margarine. The mushrooms and summer squash looked so good that I picked some of the up and a red pepper. The vegan pizza came out really well, except for some reason that bread dough for the crust required a lot more kneading and working than it has in previous makings. Thankfully I had a student who really knew how to work with it and was a great help. He even explained to the other student working with the dough what he was feeling and when to change his approach. It was like having a pizza dough teaching assistant! Phew. Is the week over yet? Well, Fridays I have off so, sort of. But I have a couple ethical eating ideas in the works--one given to me by a student who asked about the chocolate in nutella. And much to my surprise, it appears that making a nutella type spread isn't too difficult and with more ethical ingredients, I think I can make that student's day! I'm planning on testing it out first, though. More on that later! It may be a week into June, but spring has been long coming in the Inland Northwest. I was reminded of the poem "Nothing Gold Can Stay" by Robert Frost tonight as I was making two salads for tomorrow. One for lunch and one for dinner. After teaching class and our field trip to Roast House Coffee, I am heading across town to a meeting about our local food community sponsored by the Regional Health District. I'll surely have interesting things to say on both the field trip and the meeting. I have been loving my salads recently, but likely only because they are the first salads of the season. They really aren't very interesting or colorful. The salads I made for tomorrow have red leaf lettuce, cucumber, English peas, roasted asparagus and leftover oven fried chicken. The chicken is the only thing that isn't green! I am hoping that soon there will be more colorful veggies to be adding to the salads, but that of course will mean the end of the asparagus and phasing out of the peas. The seasons within the growing season do march on. As I do more reading about local food and sustainability and the critique of the local food movement, I am struck once again that eating seasonally is a better compromise on a lot of these issues. I eat locally because I want to eat more intentionally, more seasonally, even though it is often difficult being an urbanite as I am. I have more information about my food this way, and that is reassuring to me given my food values. Nature's first green is gold--as we anxiously await the green coming into our lives as leaves on trees, lush grass and good food, we are reminded that there is something bigger than ourselves that has a memory into the past and will stretch out ahead of us long past our lives. The green that indicates the beginnings of life will eventually fall away, as the title says, "nothing gold can stay." There is a life cycle at work both in our own lives and the plants and animals we eat. We can't forget that. Frost's words are a very nice way of reminding ourselves of this fact of life. Today is the last day of the Art Fest in the Park that the local museum puts on the first weekend of June every year. It always features food booths as well. But this year I decided to picnic in the park with some friends listening to one of the musical acts. Picnics always make me think of either summer food or weirdly, take out from Au Bon Pain in Washington, DC with cherry blossom petals falling like pink snow--a memory from college. So I made oven fried chicken with homemade BBQ sauce or homemade honey mustard sauce, potato salad from my Mother's recipe and brought sparkling water. One friend brought corn bread (hers is much better than mine--I should get that recipe) and the other a rhubarb galette with orange sauce and whipped cream. I ran into her at the farmer's market yesterday and we discussed what delightful sweet thing she'd bring. 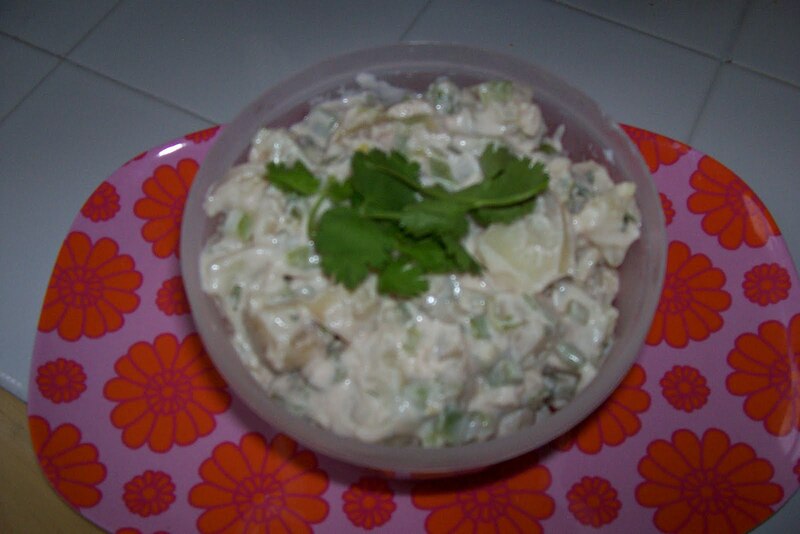 Mom's potato salad--I love it! We had much better food than the fare food that was being sold. Don't get me wrong--sometimes fried dough, hot kettle corn or other fare food treats really hit the spot. But it's over-priced, not terribly good for you, and who knows where it is from or what is in it. Since the park is just a block away, I don't have the "I've gone to the fare" feeling that would help me justify that food. I'll get my kettle corn when I head to the ball park this summer. We spread out our blanket in a both shady and sunny spot in front of the band stand, had out picnic, enjoyed the music and finally got some sun--it's been too long here and this upcoming week promises to be rainy and damp again. I hope everyone in town was able to get out this weekend. 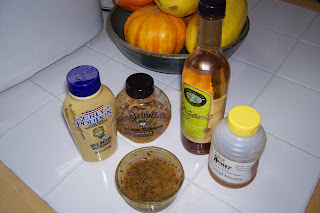 And a recipe today--my Honey Mustard Sauce/Salad Dressing. 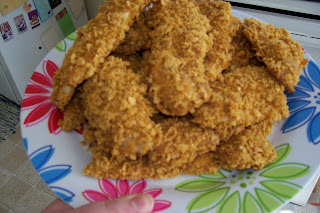 It's almost too easy to be a recipe, but it is so much better than anything out there commercially and completely fat free. A little thicker it is a great dipping sauce and a little thinner it's my favorite salad dressing. Equal parts honey, grainy mustard and Dijon mustard. 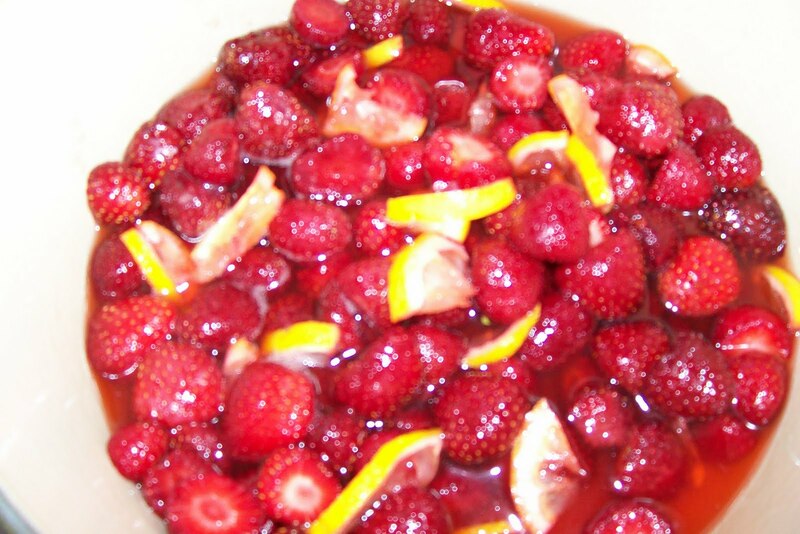 A splash or white, white wine, cider or raspberry vinegar. Stir until smooth. Adjust sweetness to taste. Delish. All the ingredients and the finished product! A word about honey. I always use local honey when I can. Studies have shown that using local honey can improve the immune system because the bees have processed local pollen. And also, studies have also shown not to feed it to babies--because their immune systems are still developing. 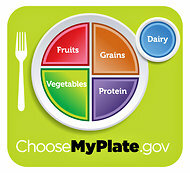 So the "food pyramid" that so many of us grew up with, which was even revised fairly recently is a thing of the past. We now have a "dinner plate" which honestly makes a little more sense. Who eats off a pyramid anyway? It will be interesting to see what the fall-out is of the change. Even Michelle Obama has already offered some criticisms of the organization of the plate and it has only been officially released for a few hours. It seems to me that it is a better graphic, but only if people have enough food information. That's sort of what the First Lady said as well. That saying "protein" will make a lot of people think of meat, whereas a lot of protein comes from other sources. I think also the little "dairy" circle above the plate will make a lot of people think of milk in a glass, and even having a section labeled "dairy" is problematic for vegans and explaining why they might still have a healthy diet (although less so than the old food pyramid). So, if the new "dinner plate" is really going to work, it is going to take a lot of food education, which was also true for the food pyramid. That education doesn't always seem forthcoming by the government or educational system but has been mostly grass-roots and that has been a problem. In addition to food education, healthy nutritious food will also have to be available widely for the intentions of the "dinner plate" to be realized, which is another real issue in American given poverty and processed foods. Still, it seems to be a step in the right direction, but just one step. 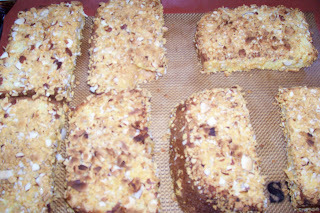 See those sliced almonds and crushed cornflakes? When I was in Chicago, well, more precisely, Oak Park, for Spring Break this March I had breakfast out at a little hole in the wall type place with my hosts--my college roommate, her husband, and one of their daughters. I had a fairly standard brunch out meal for myself--french toast. But this french toast had a twist. 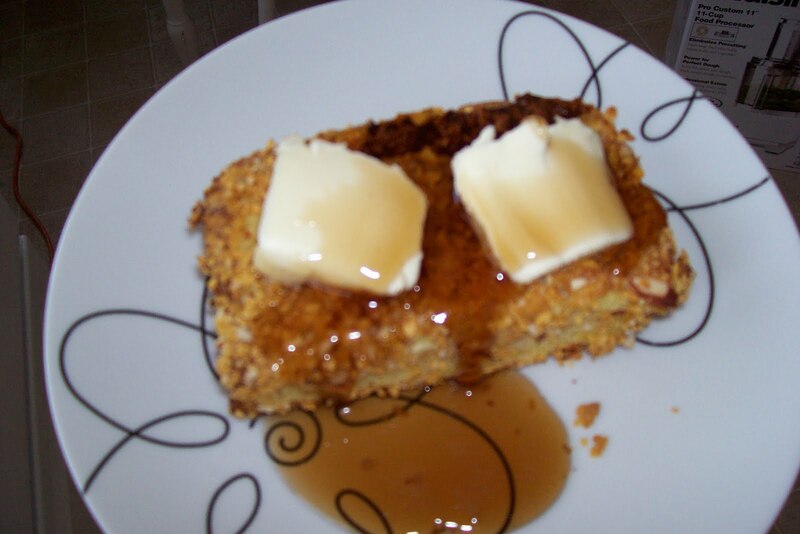 It was cornflake crusted french toast. And I have been thinking about it ever since. I know I have blogged about french toast before, but it really is one of my favorites and now that I bake it, much less of a hassle to make and always comes out perfectly. Last night, thinking about eggs I should use and half a loaf of brioche, made this the morning to try this twist on french toast at home and I had an inspired twist on the twist. I crunched up some sliced almonds with the cornflakes and used almond extract instead of vanilla in the custard. It was pretty good. Surely good enough to remember and try again. I can only imagine making it for guests--it is sure to bring a smile to their faces. But I am sad to report that the restaurant at which I had this meal is closed. They have two other locations, but the one I ate at, sat in the window, slipped across the icy Chicago streets to get to, discussed parking meter etiquette with an elementary school student at, has closed. They have two other locations, but there isn't much to explain why the Berwyn location closed. Perhaps my college roommate knows. Surely, it seems, her girls will miss the Berwyn Wishbone. Maybe it is best that I did not discover this until after I tried making that french toast and declared my twist on their twist good--I am afraid if I knew this I would have tried and likely been disappointed at any recreation I might have attempted. But as far as ethical eating goes, trying to recreate restaurant favorites is a good plan. It means you can know more about your ingredients, try different twists yourself (like my almonds), and really wow your friends if they work out well. For a long time dietitians and those concerned with healthy eating have recommended this approach to reduce fat and calories in restaurant favorites. It can work just as well for ethical concerns. And has the same limitations, too. Somethings cannot be made low fat or more ethical. Some things just have to go. As far and french toast goes, it can be made more ethical and also like they do at Wishbone, even if no longer in Berwyn. Thanks to Mel and family for taking me to brunch. I'll have a fond memory of good food and friends, even with the restaurant gone. When I was a kid, we had a rhubarb plant in the backyard. We, like all kids who have a rhubarb plant in the backyard, we warned not to eat the leaves because they are poisonous. Honestly, I can't imagine going up to some random jungle looking plant in the backyard and thinking to myself "oh, I think I'll eat this elephant ear sized leaf." But, whatever. I guess because parents know that kids do stupid stuff and think that if they know we know we can eat the stalks, we might try a leaf, they dutifully warn us. For all the food we ate from the garden, I don't remember ever cooking with the rhubarb. I remember my brother eating it raw, just to say he did and cutting some up and trying to get the cousins to eat "pink celery" as a trick. But I still had two large stalks left and I knew just what I was going to do with them. 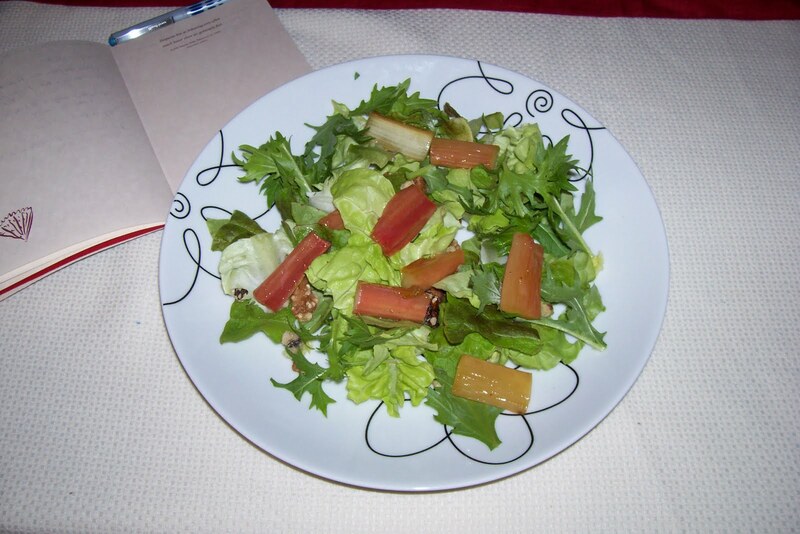 I had seen a recipe for roasted rhubarb salad. What a great idea I thought--there aren't too many vegetables for salads even though there is now lettuce. So, I followed the recipe up--warmed some honey, tossed the rhubarb pieces in it and then roasted in the oven just until soft. Well, I don't normally consider myself someone who likes really sweet things, but that rhubarb roasted on the salad was so sour I could hardly eat it. But there was easily two servings more left on that roasting pan. I tried again--lettuce, mizuna, dried cranberries and roasted rhubarb. I brought it to school for lunch which meant I really would eat it or else have to get take-out to make it through my three hour afternoon class. Still it was hard to eat, as valiantly as I tried. Maybe third time's the charm? I'm a week into the fourth time of teaching ethics of eating. Class seems to be going well so far. It is sometimes hard to tell so early in the session. But I have a handful of students taking the class for philosophy credit and a couple for environmental studies credit--all have been engaging in our discussions. It is nice to have a mix of ages and ethnic backgrounds as well. Today we ended our class after reviewing the food forum Alice Waters moderated for The Nation several years back (called "One Thing to Do About Food" which featured short essays by notable folks in the food community like Wendell Berry, Vandana Shiva and Michael Pollan to name just a few) and talking about memorable meals prompted by MFK Fisher's "A Thing Shared" and the musings of one of her husbands, Donald Friede on what eating at home was like, by getting into the new community garden on campus. It is part of our Campus Kitchens project. The idea of Campus Kitchen (ours is just one campus of many around the country that participate) is that food served on campus even if the college kids don't eat it, shouldn't be wasted. If that food can be given to those in need instead of thrown away, that is a good thing. Food should not be wasted. And we've now taken it a step further. During the good weather, we are going to grow some food for our community partners that during the academic year would get food from our cafeteria. This way, all year round, we can be giving back to the community in which our university makes its home. Eighteen raised beds were put in this fall and a greenhouse frame has been put up. There are strawberries and raspberries in, so too are onions, peas and beans. The tomatoes are ready to go in and there are a few beds to spare. Good things will be growing soon. In a more typical year, more things would be lush already, but it has been a cool damp spring and it is just now that the tulips have passed and the lilacs Spokane is known for are just about to bloom, weeks after our "bloomsday" road race. Hopefully things will catch up a bit or at least the growing season will be long enough for our little garden and for the farmers who make their living off the land here. So, my class spent some time in the garden today and we will again in the future. The weather in Spokane is getting better, the sky is blue and the sun is warm. Time to get my hands dirty and do a little good in the world. Spokane Farmers Market -- 5th and Browne. I am a college professor so each fall when the new academic year gets underway I ask and am asked a lot "how was your summer?" But today, the opening day of the Spokane Farmers Market, one of the farmers with whom I have become friendly asked "How was your winter?" A good reminder that the wax and wane of the year means different things to different people. They had much to tell as did I. It has been a cold, wet spring and I have been worried for the region's farmers. I have heard on the news that the vineyards are weeks behind in flowering and some of the garden starts at the market today were newly out of their greenhouses. But today, a glorious, sunny and warm spring-turning-to-summer day, the Spokane Farmers Market opened. There were more stalls and more things for sale than I had expected. I was able to get some really wonderful things. I got asparagus, spring onions, walnuts cured from last fall, some hard red winter wheat flour, some beautiful eggs and most spectacularly, some golden morel mushrooms. One pays for those mushrooms dearly, but there is really nothing else like them and here in the inland northwest there are pockets of them that are well-guarded and well-loved. I am thinking that tomorrow I will make quiche with the eggs, asparagus, mushrooms and onions. There were other things for sale, too. Potatoes, jellies and jams, fresh cheese and bread, radishes, rhubarb, carrots, beef, pork and chicken, and lots and lots of garden starts of many varieties and sizes. I am back to my late spring/summer/early fall ritual. Up early on Saturdays and to the Farmers Market, then to the co-op if there is anything I need (although with more meat, cheese and eggs being sold now at the market, trips to the co-op may be fewer this season! ), then home and laundry and still some of morning left at that point. It is a ritual grounded in both the simplicity and necessity of daily life. So when my professor friends ask my how my summer was, not my winter, I'll have something both wonderful and ordinary to tell them. I ate well, talked with those that grew what I ate, enjoyed the city and the country at once, that's how my summer will be. This weekend is the first of the Spokane Farmers Market and I am excited. It has been a wet, cold spring here in the Inland Northwest so I am not sure what there will be, but whatever it is, I am going to buy some and support my local farmers. Plus, I am looking forward to meeting the new baby of one of them! I guess that's something being grown and raised! The spring semester is over and summer school is about to begin. I am teaching my ethics of food class once again, so will be sure to be blogging more as my thinking turns more readily to food and the values behind it. Thanks for your patience during my break from blogging! My thoughts have turned to spring. It is too early, I know. Here in the Inland Northwest we could still get major snow storms as it is only mid-February. But my thoughts and my food thoughts especially, have turned to spring. Delicate greens rather than winter squash, asparagus instead of root vegetables. So, Saturday I went to the Co-op. Surely there, even if not local, I could find some vegetable a pale shade of green that I could justify. I walked into the store and turned the first corner after getting a cart. I had some other items on my list, like local flour and coffee, but the produce section beckoned. And there, in the midst of all these treasures was a bin of Brussels sprouts--yes, I said Brussels sprouts. Small and pale green, tight little heads. My sister called them "stinky little lettuce balls" when we were kids the summer Dad accidentally planted them and not broccoli. But I admit, I like them. From those little green heads my own head turned to thoughts of the wheatberry roasted Brussels sprouts salad that the Co-op deli used to have before the chef changed. Could I reproduce that? 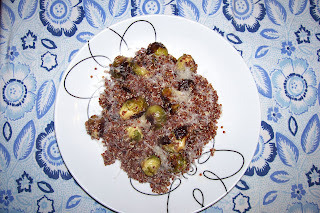 Surely that would be more ethical -- fewer Brussels sprouts needed and local wheatberries. A plan developed. I grabbed an organic lemon and a hunk of Parmesan cheese for the dressing, cruised down the aisle passed the wine and cookies, crackers and tea to the bulk section. I took a plastic baggie and a twistie tie for the bulk bin number and went over to the bin for the wheatberries knowing I had only a few tablespoons of them at home. Then, tragedy struck--the bin was empty! Ack! What was I to do? I left a little dejected. So, no wheatberries. What might I use instead? I left the Co-op with the veggies, flour and a few other items, but nothing to use instead. I had not decided what to do. I got home and looked in the pantry. There was wild rice bought on my last trip to Minnesota, orzo pasta, white rice (oh, why did I not have any black japonica, that might have done nicely!). I had no barley, not enough wheatberries. Then I decided, quinoa. Quinoa is not really a cereal grain I learned long ago, but is a good source of protein and was highly prized by the Aztecs. It has recently had a bit of a comeback. It is easy enough to cook, and relatively fast--much faster than polenta, faster than rice. And it has a slightly nutty, slightly grassy flavor and just a tiny bit of crunch. 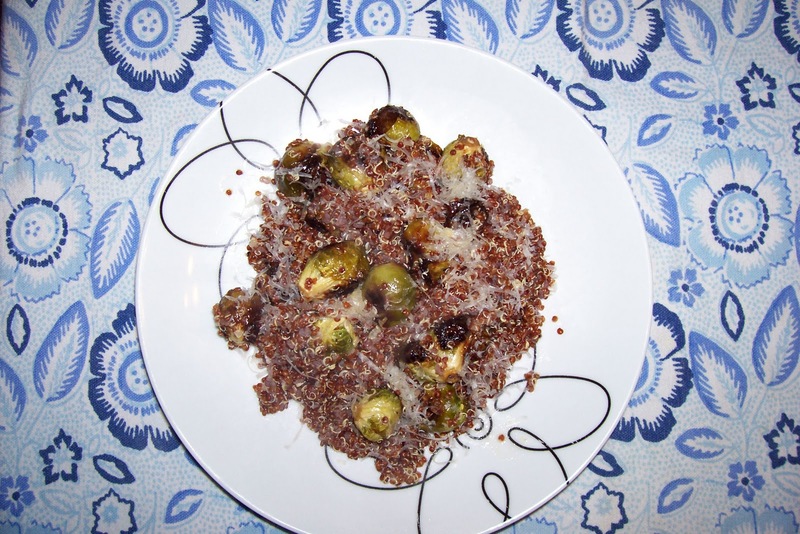 Now, was my quinoa and Brussels sprouts salad as good as the one with the wheatberries? No, the texture and size of the quinoa is substantially different. But the idea was good and it resulted in a perfectly good side salad. Changing up the grain or "bulk" in side salads can result in something quite good. This was good, although, next time I see wheatberries I can be sure to stock up! Recently I was out to dinner with a friend who commented that he really likes fortune cookies--to eat. Lot of people like the fortunes but don't really bother to eat the cookie. (Some, I know, eat at least part of the cookie for fear the fortune won't come true without eating some of it.) I eat the cookie if mostly because I hate wasting food. 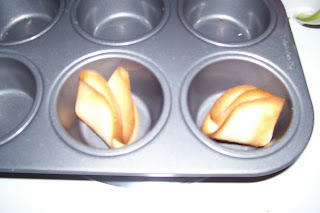 I had heard you could make them at home, personalize the fortunes to whatever you wanted. But I never really thought about it very much. Until my friend mentioned how much he actually really liked the cookies. So, I thought I would try making him a batch. It actually is pretty easy. The trick is, I think, asbestos fingers, thin enough batter and working fast. Admittedly, I watch a bunch of youtube videos to get the recipe and the basic strategy for getting the cookies off the baking sheet and folded up with a message inside. The silpat helped a lot. Preheat over to 400 degrees. Bake for about 8 minutes, but watch carefully, only the edges should brown. Make cookies first just two at a time until you are confident you can get them off and folded before they cool. Once folded put in the hollow of a muffin tin to cool. This helps them keep their shape. 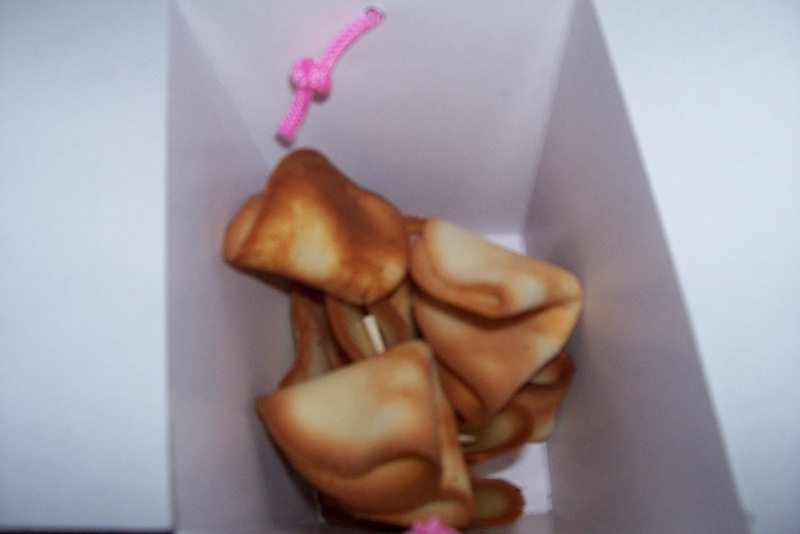 Once cool they are crisp and just like fortune cookies. Imagine making an Asian inspired meal with local and seasonal ingredients and serving your own fortune cookies at the end. You could even put message about the sourcing of the ingredients or other ethical feel-good messages inside! I saved the egg yolks and will do something with them tomorrow. I have some other baking to do and such tomorrow, so I am sure I can figure something out. So I am in the middle of testing those two recipes I mentioned in my last post--baked brioche french toast and polenta mushroom diamonds. The baked brioche french toast is amazing. I am pretty impressed that the bread machine made such nice brioche. 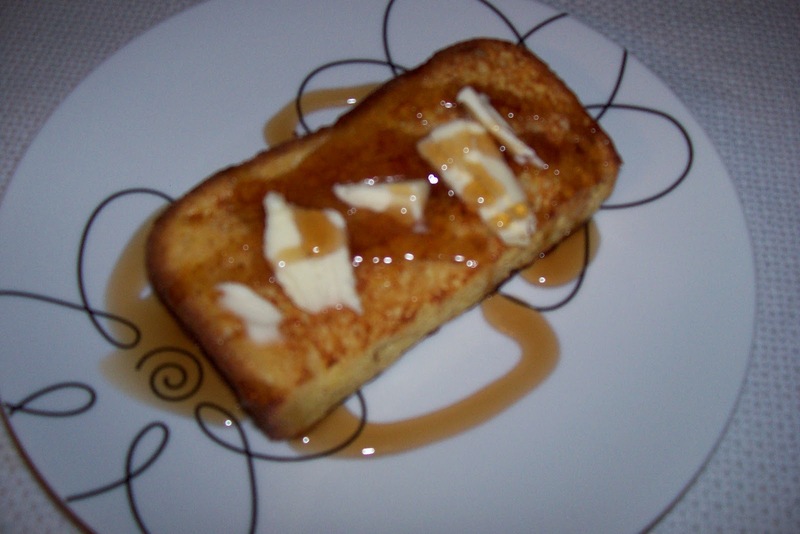 I made only a half recipe of the french toast to try it out. Not because I was unsure what I would do with all that french toast, but because I know exactly what I would do -- eat it. That said, after having what the recipe said was one serving for breakfast this morning, I am wondering if I should have just had half. It's fabulous, but filling. A slice of french toast that is an inch thick is a lot. I was a little concerned this was too brown! Last night I cut two thick slices of brioche, cut those in half, made the custard mixture and drenched the bread on one side. 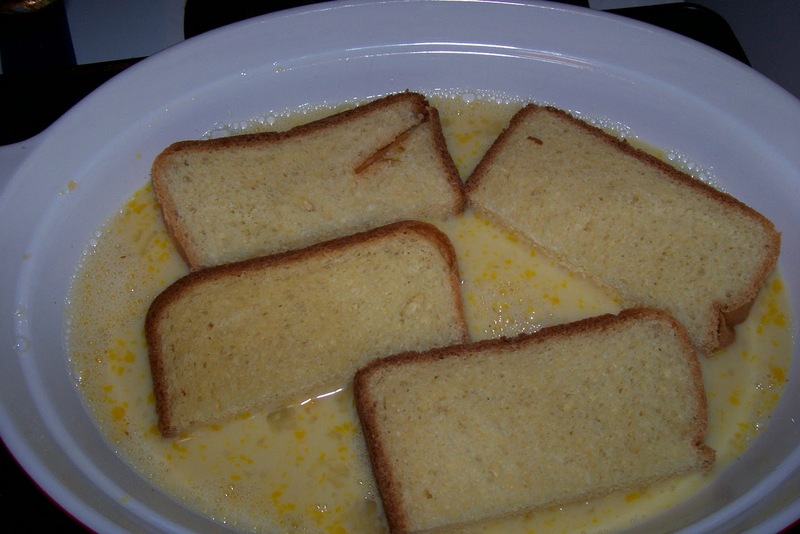 Before heading off to bed, I turned the bread in the custard and put it in the refrigerator. This morning I transferred those slices to a baking sheet, on which I had put my silicone baking sheet. I was worried about them sticking. When the buzzer rang and I pulled out the french toast I was a bit concerned that the silpat was a mistake--that side was really brown. 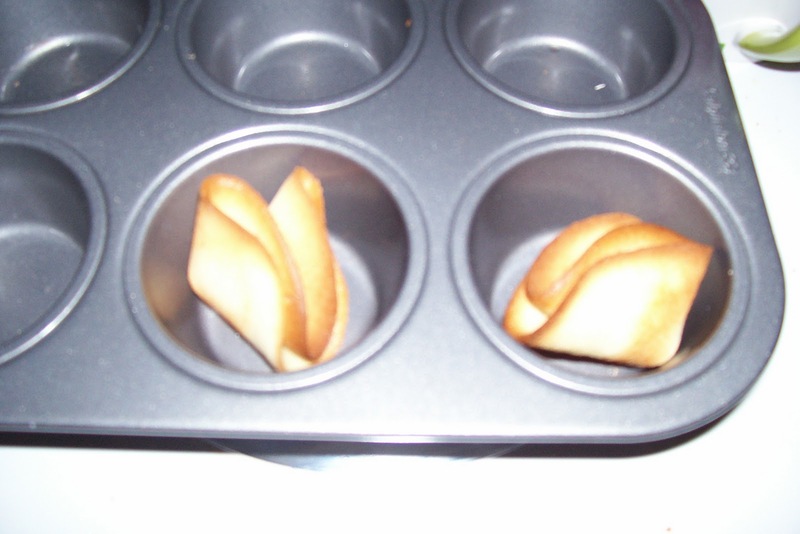 But once I flipped them over for a couple of minutes and got it ready to serve my skepticism abated. Boy, is it good. 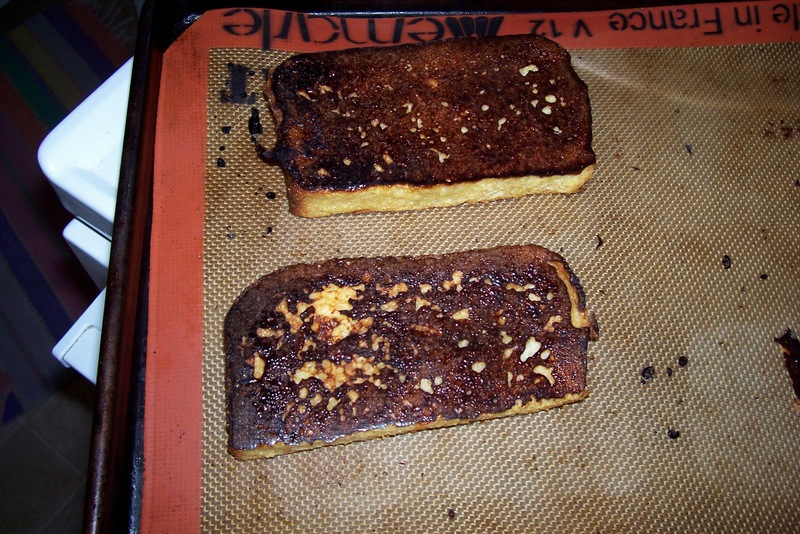 The outside was just a little bit crispy and the inside was custardy, soft and moist. And no frying! But, I think for my brunch I am going to cut those slices into quarters. People are welcome to more than one, but for a brunch buffet people often want to have a little of this and a little of that. This french toast is rich and lovely, so maybe people will just want one quarter--or maybe since it is so good they'll want more! Admittedly, I got this recipe from the internet and made it just as directed, but it is good enough to share here. This is probably the only way in Spokane to get organic brioche anyway. The first slice of the brioche. Warm brioche, yum. 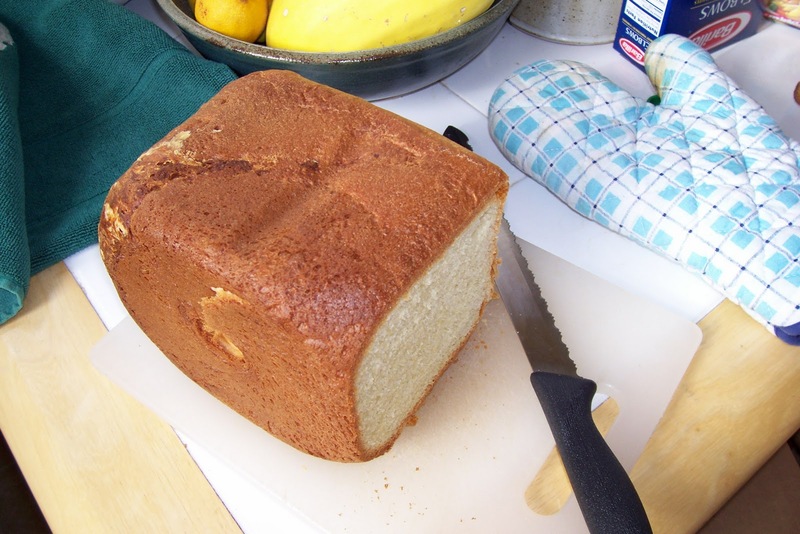 Measure the ingredients into your bread machine pan in the order suggested by the manufacturer. Process of the sweet bread cycle if your machine has it. If not, process on the white or basic machine cycle. Use the lightest crust color option available. Remove bread from pan and cool on wire rack or wrapped in a clean dish cloth. The recipe for the custard for the french toast is my own, but the method for baking it rather than frying it is from a ugh, I am going to admit this, a Martha Stewart recipe. For four servings (that, might more reasonably, be eight). In a large baking dish whisk together eggs, milk, sugar, vanilla, salt and cinnamon. Arrange bread in dish in a single layer. Let soak 15 minutes. Turn bread over, cover, and refrigerate over night (preferable) or at least 30 minutes until most of the liquid is absorbed. Preheat over to 350 degrees. 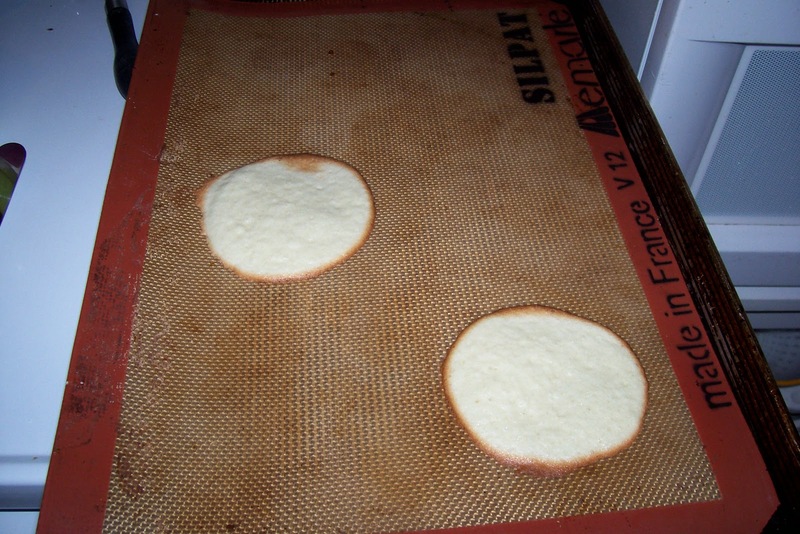 Oil a rimmed baking sheet or line with a silicone baking mat. Carefully transfer the sliced to the sheet. 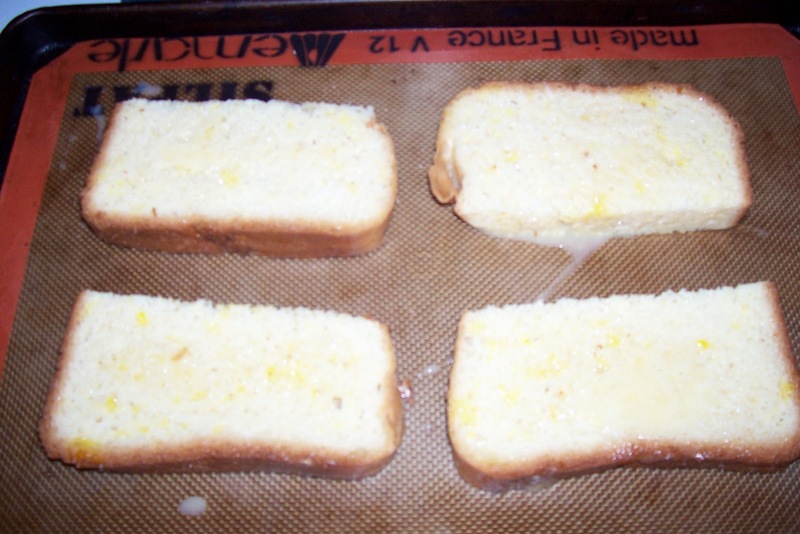 Bake french toast until it is set in the center about 25 minutes. Flip slices and bake for another 5 minutes. Serve with butter and syrup. For an extra treat, stir a little cinnamon and brandy or orange flavored liquor into the syrup. Eager to get the second recipe tested I found myself mincing onions and mushrooms in the food processor before 10:00 am on a Sunday morning. I used my oven method for making the polenta (so much easier than stirring, stirring, stirring and completely indistinguishable in taste and presentation). The polenta is now cooling on a baking sheet and so is the mushroom filling. I am anxious about this recipe. It is pretty much new and I am really wanting something savory that is vegetarian for this brunch. I hope to have a positive report on this one later in this afternoon! I am a single urbanite philosophy professor living in the Inland Northwest who has a passion for good food--food that tastes good and is ethically good.